Where have the Frocks Gone? I’m getting to pack up and move this weekend. I’m pretty excited as all the studio gals old and new are coming in on Saturday and we’re packing it all up. Quite a bit of the stuff is going to Audrey’s place as she will be home base for all our home sewers to pick up and drop off their dolls. I like the idea of these bits of Bamboletta still being around at her place – it’s a nice continuity. I love the new stuff we’ve been creating lately – like this lace front tunic. So sweet! So, let’s talk Frocks. While things get settled and I establish a work flow between my new place in Vancouver and the studio over here on Vancouver Island I am holding back on frocks for the time being. And I have some ideas on how I’d like to bring them back in – I was thinking of a made to order section where you can choose your dress style, fabric, accessories and then the order is made up and shipped out to you. And/or a super highly more ‘curated’ Frock selection – so, more outfits like what you see on our upload dolls. Anyhow, going to get through this move first and then figure that out. I hope within a month or so. I just want to wish you all the best in your move and relocation. I have no doubt that you will be settled in and back up and running full speed in a short time. I look forward to reading how you are adjusting and tackling this newest adventure. My ‘why’ – right here. 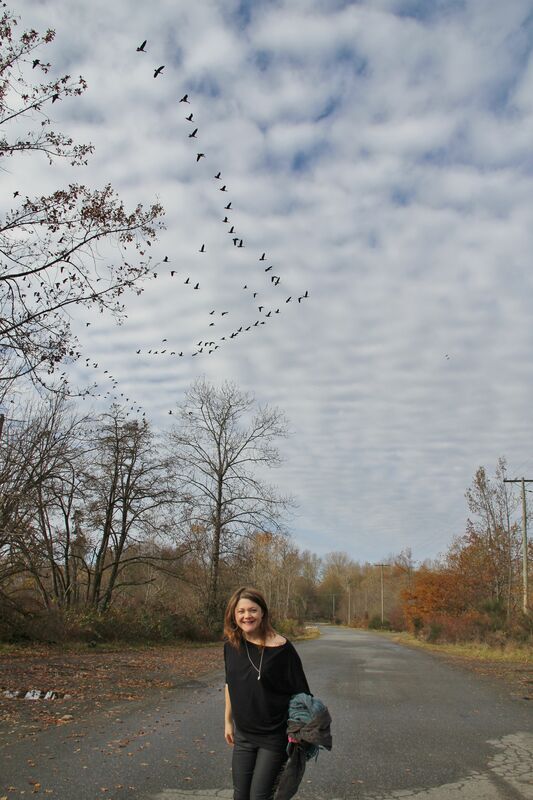 Photo by Erin Wallis. A little update – I’m moving to Vancouver but keeping production on Vancouver Island. It’s like I’m back in my early 20’s setting up a new place. I’ve half way moved into our apartment in an area called Mount Pleasant in Vancouver. It’s been a real joy setting up, I’ve gotten rid of so much stuff, it feels so liberating. I’m not even a ‘stuff’ kind of person but it’s crazy how quickly it accumulates. I’ve set up house based on this amazing book called ‘The Life Changing Magic of Tidying Up‘. One of the philosophies in there is that if it doesn’t ‘spark joy’ in you, toss it. If you are only surrounded by things you love you and not things that carry baggage then your mind can be clearer and more relaxed. I’m going to be working in my home until I can find a suitable studio so I want things to be as uncluttered as possible. I’m equal parts excited and nervous about this new venture. As with the paring down in my home, I feel like I’m paring down in my business and really getting back to the ‘why’ of what I do. (I HIGHLY recommended you watch this Ted Talk ‘It Starts With Why’). The past year or so has pulled me away from the why of what I’m doing – stresses from running a business, being away from my family, finances, and then all that attention after our award (which was amazing, yes, but a bit of a trip!). 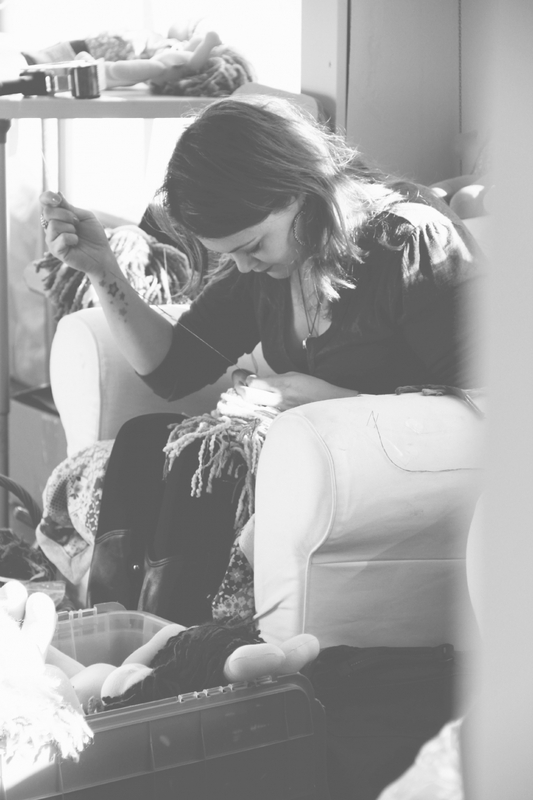 I always took solace and comfort when I spent those 3 days a week in my chair sewing the faces on- doing what I love – bringing the dolls to life. Those times would act like an anchor. So, why do I do this? What is my ‘why’? To spread joy and delight through my creations. 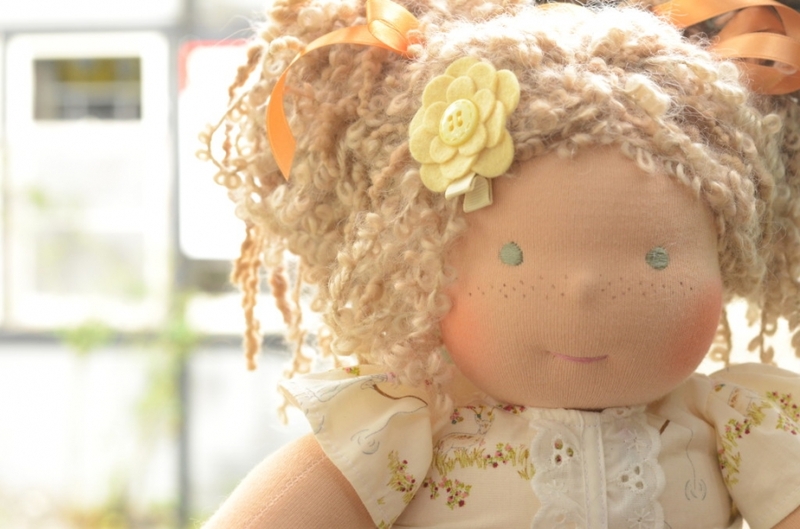 Through the art of handmade we embed magic into our dolls for people all over the world to feel and be connected by. And from a social and political standpoint – that ‘making’ matters in ways that go far beyond the end product. People have a choice on what they want their future to look like and that this business model has far reaching benefits. Describing your ‘why’ is so difficult – it’s in the emotional/feeling part of the brain and hard to articulate, so this is the best I can do. In the 12 years or so I’ve had Bamboletta I’ve experienced many expansions and contractions – much like breathing. Right now, I’m in a contraction, getting close in again to why we do what we do. I’ll huddle around it for a bit and let it warm me to my bones. Then I’ll be ready for my expansion – whatever that may be – and the not knowing is the great adventure. Beautifully put Christina. 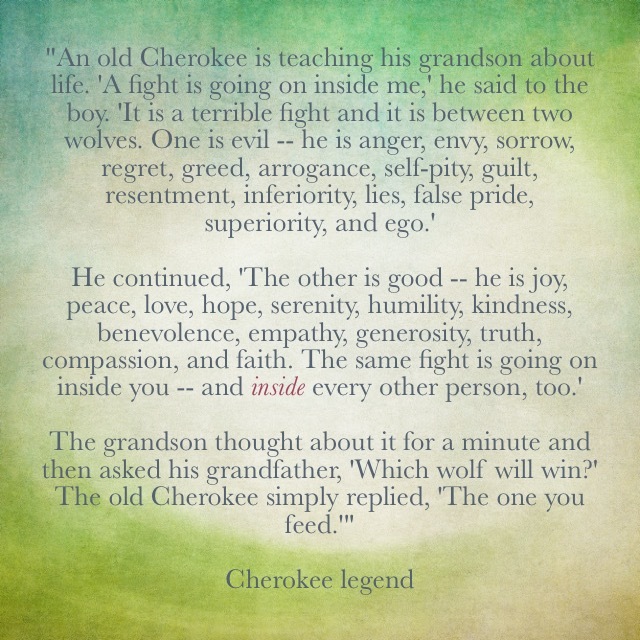 Definitely words to live by. Love and Hugs from David and Me. I wanted to say thanks for all your well wishes as I embark on the next step in my journey. Reading all your comments, texts and emails has made me feel unstoppable. I really can feel all of your support, love and well wishes – it makes me know I can do this and it’s going to be freaking amazing. You gals, what can I say? So much love for you all. Really. What we do here is so different then something like just selling shirt or whatever. It feels unique. 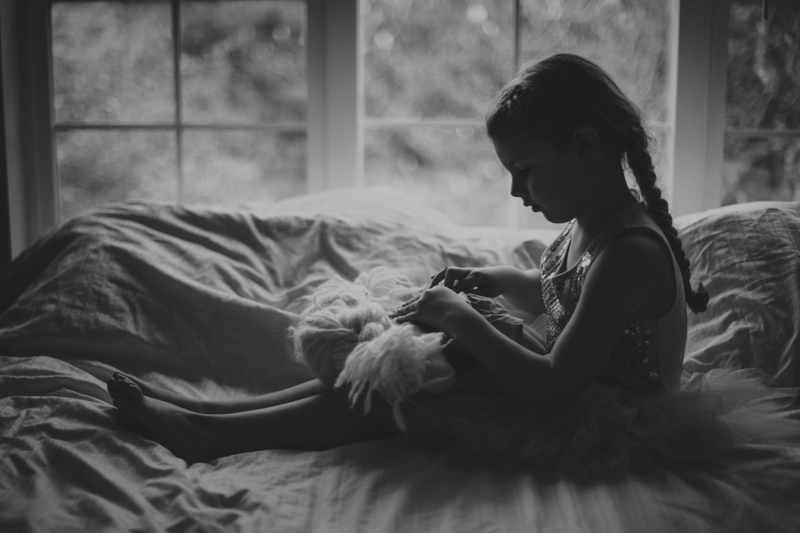 There is a love and a bit of magic that connects us through the dolls – I really believe it. I don’t know if it’s because of how long the doll takes to make or the natural materials absorb something special, but there is something pretty cool about the ‘life’ of a handmade doll. Maybe, you think I’m crazy. 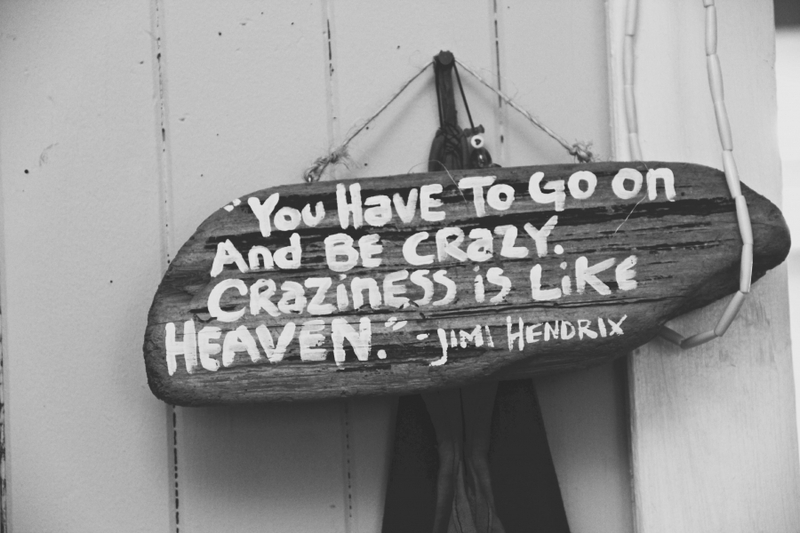 Well, as Jimi Hendrix said in one of my most favorite quotes ever .. The past few weeks felt like a choice to me. Either I go down a vortex of self pity and shutting down or I go this way. I have to admit, that vortex of self pity can feel pretty good sometimes – like an itch you know you shouldn’t scratch. Especially when you are tired and stressed. I’m so thankful to have the support around me to be able to zoom out and see opportunity and wonderful surprises in what looks like a catastrophe. You gals out there are a HUGE part of why I’m able to see things the way I do and I thank you from the bottom of my heart. I have some pretty huge news. Huge for me – life change news kind of stuff. I’m closing down our Whippletree Studio in May and moving to Vancouver. 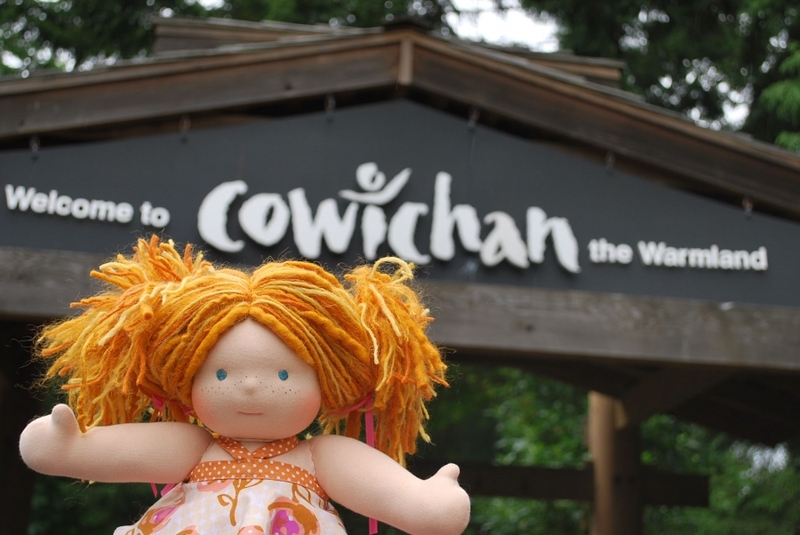 Doll making will stay with the lovely sewing mama’s on the Island but myself, and my family are moving back to Vancouver. In case you aren’t familiar with west coast BC geography and are new to Bamboletta – currently I live and work on Vancouver Island which is about a 2 hour drive and a 2 hour ferry from Vancouver. I moved to the Island from Vancouver about 8 years ago. It was a series of events that have pushed me to this decision. I’ve had a pretty tough few years with both my father and mother being seriously ill. It hurt my heart not to be there to drive my mom to appointments or spend time with my dad by his bedside while he waited in the hospital. I’m so close to my parents and these events took their toll on me. But I’m not in a position to just take time off – I have an immense obligation to Bamboletta, to my team that rely on this(me) to feed their families. Also, I am the sole provider for my family and ,well, with everyone to pay and all the expensive supplies, it’s a tight ship to say the least. I am so heavily involved in the creation of the dolls that if I disappeared for a while, everything would shut down. Thank God I had Brooke and Brandi to handle it all with me – to essentially become extensions of me so that we were able to make as many dolls as we did with the joy and love that the dolls deserved. Then Brooke left just before Christmas to live closer to home and be with her family. She still handles some online customer service stuff but the rest of her work fell on me. Then, about 2 weeks ago, Brandi told me that she wanted to leave to travel and be free of any obligation. That felt like a big punch in the gut. As a friend, well like sisters really, I TOTALLY get it – she is at a point in her life where she is finally free and I’m so happy for her. But as a boss who relies on her to oversee what goes in and out and spending so much of my time over the years teaching her how I see what I see – SO many little details – the news was devastating. And exhilarating. Really, really exhilarating. One thing I’ve learned in business over all these years is that when it all seems to hit the fan, there’s something really fantastic around the corner. The trick is to stay open and trust. Although Brandi is leaving, she’s not really leaving. She will still do doll noses and come to Granville Island when I have markets. Almost everyone who has moved or left still has some part in Bamboletta – it really becomes a part of you. The day I found out about Brandi I was talking to a good friend who happens to be an amazing coach. ‘So, now what?’ came up. Hmmm, now what? I can’t keep production up to our 80 or so dolls per week without Brandi – it would take me a long time to train someone to replace her. I knew immediately that I could not physically do any more then what I do now – after Brooke left I was working more then I ever have in my life and it was starting to take it’s toll on me. Thankfully Bran gave me a few months notice so nothing immediate had to be done. ‘What about Vancouver?’ Chela had been listening to me lament about wanting to move back for the past year. My family, my friends. the city – I missed it all so much. Then the light went off in my head and I felt this expansive freedom – yes, Vancouver! She then told me that the apartment she was moving out of was still not rented and it is exactly in the area I want to be in (east Van – my old stomping grounds and in the catchment for the school I want the boys to attend). I called the landlord and ,just like that, I had a place to live. I won’t bore you with the long account and revelations around keeping the dolls being made on the Island but that’s what is going on. 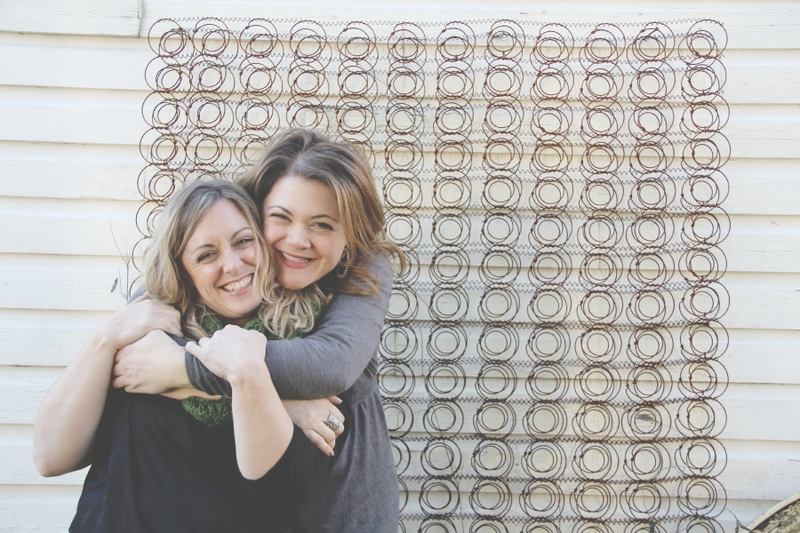 Audrey, Jes and Andrea are incredible and have been with me for a long time – they will handle the sewing mamas, dyeing, cloth sewing. These ladies are amazingly talented and have surpassed me in the technical skills of making an incredible doll. We will be creating about half the amount of dolls per week and I will do the faces, upload and ship from my home studio in Vancouver. Twice a month I will come over to the Island and do all the aesthetics – hair bundles, pick up dolls, deliver fabrics to be sewn into clothing, make sure everything is running well – making sure the overall ‘Bamboletta – ness’ of my dolls stays the same. Less dolls for me feels super right. I can pick up my kids, be there for my family and be in a city that makes me thrive all while still doing what I love to do most which is to create the dolls. This has been one of the hardest and easiest decisions of my life. Hard in the details (the who, what, where – and moving a 2700 sq foot studio PACKED with stuff) and hard in leaving my studio (I LOVE my studio) – but easy in how the answers and solutions have flowed to me and how it’s just happened. But then again, I should not be surprised by this at all. This business has always flowed in an organic way. So, starting in May there will be less dolls available. I’m aiming for about 40 a week and still do the Monday, Wednesday and Friday uploads (I love the smaller uploads). I will be working out of my home (John and Acorn will stay on the Island for the next year while he does a course) until I find the perfect little studio spot. I’ll do the uploads, faces, hair, styling – all the fun stuff that I love most. I want time to devote to work with women’s shelters teaching doll making classes and I do more of the philanthropic stuff that makes my hear sing. I’ll have time for my family, to blog, to do some workshops – oh man – so much time is opening up for me I’m so excited! Totally didn’t think this would be such an epic blog post. Thank you – all of you – for loving my dolls all these years and seeing the ebbs and flows of my business. I’m excited to have you all along to share this next chapter of my story – who knows what it’s going to bring? You will be really missed over her but what a fantastic decision for you! Bless you and Brandi in your new adventures. Two sweeter ladies I have never met. Good luck, Christina! I’m glad things are working out for your family and Bamboletta. I love your dolls. They are adorable. I have never been able to buy one, but I was so inspired that I made two for my precious grandthings. Keep up the great work and take care. Thanks for sharing. Enjoy every minute of your new adventure! Whippletree will miss you. Good luck to you and your family. Congratulations on the changing of seasons in all of your lives. It sounds like the right paths for you all. I think the clarity, happiness and peace will show in the dolls beauty and life force. I pray for continued success personally and professionally for you all. Enjoy! im sad that the store will be gone. I never did get to come over and experience it. But I am so very happy for you! I’ll get myself down to Granville island since its close. The dolls will still be there and we will all still LOVE Bamboletta and the way it makes hearts sing. And you – your heart will sing, too, being where you want to be. Serendipity, when it happens you have to follow the path to the joy it brings. And, well, there’s a chance now I just might be able to take a class with you. How awesome is that?!? Wow! You’re amazing! I love the way you’ve come through it with excitement and joy and love that you’ll be closer doing fun stuff. Hopefully that means we will see more of you! Wonderful things are in store for you, I just no it. Congratulations on a whole new amazing time in your life! I can’t even say how excited I am for you! So many amazing changes to get you right where you want to be <3 It's pretty incredible when huge scary things happen that kinda knock the wind out of you and you're able to take a step back and see it's the universe giving you the push you have needed. Good luck with the move and all the changes to come C! I love that this post conveys your emotion so well! Sounds like a big but great decision for you and your family! As someone who covets a Bamboletta for her little (who is so little it’s mostly for me), I’m sad that there will be fewer dolls, but happy that I can hear through your words just how happy this move will make you! All the best! SO excited you are moving back to Vancouver. And a workshop?!?! Hooray!!! Please let me know if I can help in anyway. I’m in Deep Cove. I hope that doesn’t sound too stalkerish:). Congratulations and warmest wishes on your move. Wow, I have loved everything about the way you handle yourself and your business from the get go. No doubt you will continue to inspire and find inspiration all along this journey called life, because you are so open to what you hold true! Thanks for being such a positive and shining example. xo, from a longtime fan in Wisconsin, USA. I am so happy for you, John, the children and your family. It sounds like a dream come true that you are starting a new adventure. I am just so glad that David and I where able to visit the charming studio in Whipletree Junction. You are getting the opportunity to have the best of both worlds. I wish you all the wonderful things that life can hold. You are such a dear person. I am proud to call you my friend. Love and Hugs. Christina, Thank you for the opportunity to work with Bambalotta Dolls. I wish you all the bet in your future . I’m really sad i cannot just come by your little store and Visit and see the dolls.You will be missed i think less is good and it opens up more opportunities for you and your family. Family is so important. You will still visit the island and that’s good. Even though it may seem scary new beginnings can be fun and exciting. I love what your dolls have brOught to our Community. This post and this major life decision really resonate with me. My dad’s health is failing quickly and being two and half hours away (here in Ontario) with a toddler, job, and all the rest makes it hard to be a very big part of his life right now and that is emotionally very tough – especially as he is my last living parent. I wholeheartedly applaud your decision to simplify for your family and kids and I wish you the best of luck with this big move. I just recently learned of your dolls and am incredibly smitten with them. I look forward to hopefully buying one for my doll-obsessed little girl soon. Your work and craft are inspiring! Hi Christine perhaps you do not remember me but I did some sewing for you and I loved it but unfortunately I could not set at my machine for long period of time so I had to quit , sorry you have to move and close your shop but I wish you the best in Vancouver all the luck to you and your family,you know the old saying when one door closes another one opens with better opportunities. YOU are the luckiest woman to have been given this gift from God to share with others, especially the children who receive these little treasures! I have dreamed of being able to start a business like this as I am a talented seamstress as well but not sure how to begin and make enough money at it. May God continue to guide you in your adventures! I have dreamed of being able to start a business like this as I am a talented seamstress as well but not sure how to begin and be able to make enough money at it to pay the bills. Good news for all …. Made in Canada – and now priced in Canadian! Finally! Canadian friends, have you tried to buy anything in US funds lately? OUCH – the exchange right now is brutal. We’ve been hovering at about par for a long time, the Canadian dollar even coming in stronger than the USD for a while there but currently the exchange rate is crazy ($1USD comes in at about $1.24 CAD). And I can tell how high it is because my tide of Canadian sales over the past year has come to a crashing halt. (it’s moved from about 90% US to about 10% Canadian orders to about 50/50 this past year). So, I want to do something about this. I kept my prices in US because it’s a currency everyone understands. Although I am in Canada, when you are online the world is your store. When I first started years ago I had my prices in CAD funds and would field many emails asking ‘What is that in US?!’. But this was a LONG time ago before I could link an exchange convertor in the listing so people could figure it out on their own. So, aside from the obvious financial sadness it is causing my Canadian customers it’s also making my accountant want to pull her hair out when she does my books. Trying to figure out the daily exchange rate from Paypal and then doing all the conversions so that everything balances has become a nightmare. I want to keep Tracy happy and make life easier on all of us. So, as of Monday Jan 26th I am changing my pricing to CAD funds. This is a big bonus to my customers on both ends. Canadians will save on exchange and my US customers will currently save about 24% with exchange – everyone is saving. I’ve been wanting to do this for a bit and have had some lovely customers raise concern that I will lose out on exchange. Yes I will currently, but I’ve been doing this for long enough to know that the dollar will come back to about par (hopefully – if the whole economy doesn’t tank!) – it all evens out in the long run. I feel like the timing is right to make the change now. This is GREAT news! Even when our dollar was on par with the USD, there was always something a little jarring about a company based on local and community values, etc., pricing in a foreign currency. I understand why you did it, but this change makes so much sense on a few levels. Thank you! That’s great news! I just paid my visa bill and the Canadian exchange on bamboletta purchases was $95, crazy! But just one note… your math is wrong. The savings is actually closer to 19%, not 24%. The exchange rate is 1USD=1.24CAD. But 1CAD=.81USD. Still a great discount and and wonderful gesture!